Recently we discussed the ongoing battle between California cities and Caltrans over street design, most notably cycle tracks. As it turns out, Caltrans just announced its official endorsement of the NACTO guide at last week’s Cities for Cycling event by NACTO, thereby paving the way for cycle tracks to be implemented across California. Let’s take a step back and define what exactly constitutes a cycle track, what makes them different from bike lanes, and why cities across the country from New York City to San Francisco to Lincoln, Nebraska are clamoring to install them. Cycle tracks are physically separated bike lanes that are distinct from the sidewalk and roadway. The NACTO Bikeway Design Guide defines cycle tracks as “exclusive bike facilities that combine the user experience of a separated path with on-street infrastructure of a conventional bike lane.” Cycle tracks may be one-way or two-way, at-grade or raised, and parking protected or buffered by a curb or bollards. The distinction between cycle tracks and buffered bike lanes can get blurry. Buffered bike lanes are conventional bike lanes paired with a painted buffer. Buffered bike lanes can achieve some the benefits of cycle tracks (and are often installed as an interim solution), but generally they do not provide the same permanence and physical protection as a cycle track. What Cities have Implemented Cycle Tracks? Cycle tracks are common throughout Europe, most notably in the Netherlands and Denmark. In Amsterdam and Copenhagen, over 1/3rd of residents get around by bicycle. Within the last five years, cycle tracks have been implemented in cities such as New York City, San Francisco, Chicago, Portland, Memphis, Austin, Indianapolis, and more (the Green Lane project tracks cycle track implementation here). How are Cycle Tracks Different from Bike Lanes? Cycle tracks provide enhanced safety over traditional bike lanes because they reduce potential conflict points between cars and bikes. An extensive study of cycle tracks in Vancouver and Toronto by University of British Columbia professor Kay Teschke published in the American Journal of Public Health showed that cycle tracks are twice as effective as bike lanes in reducing crashes: cycle tracks reduced crash risk by 89% whereas bike lanes reduce crash risk by 45% (relative to a street with no bike infrastructure). This study was the first of its kind in North America and confirms the experiences of European cities which have lower rates of vehicle-bicycle collisions. Anecdotal evidence in many American cities is supporting the findings of this study; stay tuned for more research as more cycle tracks are built in the US. Cycle tracks have a wider appeal than traditional bike lanes because their physical protection enhances comfort and perception of safety, thereby attracting more riders. • The Strong and Fearless (<1% of the population) are people who are dedicated to cycling and consider it is an integral part of their identity. They will ride in nearly any condition and require no dedicated infrastructure. Until about 15-20 years ago, this group made up most of the 1% of bicycle commuters nationwide. 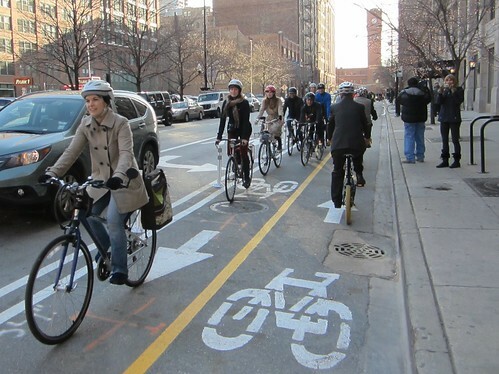 • Enthused & Confident (7% of the population) are people (often 20-something Millenials) who will bike when basic, convenient infrastructure is provided, such as bike lanes, bicycle boulevards, and bike racks. This group represented the majority of gains of cycling in the last decade in Portland and elsewhere; they include many of the commuters on Market Street in San Francisco, the students biking to class at Stanford, Berkeley, and Davis, and the members of Bay Area Bike Share. • Interested but Concerned (60%) represents the majority of people and the greatest untapped market for cycling in America’s cities. They span what’s commonly referred to as the “8-80” demographic, from 8 year old children to 80 year old seniors. They like riding a bicycle, but are uncomfortable and afraid to ride with cars as a regular mode of transportation. This group generally has a positive view of bicycling from riding during their childhood, in college, or recreationally on bike trails during the weekend. However, they desire greater safety and are uncomfortable with the limited protection that traditional bike lanes offer. They desire infrastructure that resemble bike paths (including cycle tracks). This is the demographic that the Dutch and Danish have been so effective in attracting to cycling. • No Way, No How (33%) represents non-cyclists—people who are uninterested in bicycling for reasons of topography, inability, or apathy. Geller argues that the world’s great cycling cities—such as Copenhagen and Amsterdam—have removed this element of fear by creating safe streets, bike paths, and cycle tracks. In order for cities to grow cycling beyond the “Enthused & Confident” 20-somethings and tap into the “Interested but Concerned” 8-80 demographic, cities need more bicycle facilities that protect riders from cars—more cycle tracks. Geller’s hypothesis has proven true. Another study by Teschke showed that most people would prefer biking on bike only paths, multi-use paths, cycle tracks, and residential streets (that resembled bicycle boulevards), whereas fewer preferred to bike on major streets with bike lanes. Both Geller and Teschke’s research suggest a mismatch between the bicycle infrastructure being built (bike lanes) and the bicycle infrastructure that most people are comfortable with (dedicated bike paths and cycle tracks). Cycle tracks appeal to a broader base of the population who might not feel safe or comfortable riding in mixed-traffic or in conventional bike lanes. Furthermore, more bicyclists creates greater “safety in numbers” and further enhances the appeal of bicycling, and a positive feedback loop ensues. What is a Protected Intersection? Protected Intersections are a common Dutch intersection configuration for cycle tracks; a good summary of their benefits can be found in the video embedded above. The issue at hand is how to minimize risk for ‘right hook’ crashes in which a driver turns into a bicyclist because the bicyclist was not visible. While American cities have increasingly adopted protected bike lanes (cycle tracks, buffered bike lanes, etc. ), protected intersections have not yet been implemented in the US. Instead, mixing zones for cars and bikes have been more common and codified by the NACTO guide. Mixing zones can erode many of the benefits of cycle tracks because they remove the protection between bicyclists and cars, a key criteria for the “Interested but Concerned” demographic as noted above. Protected Intersections solve these issues by giving bicyclists a head start into the intersection and forcing cars to turn at a perpendicular angle and slower speed. Protected intersections can be a little tricky to implement because of their spatial requirements; the lack of American precedents is likely responsible for their omission in the latest NACTO guide. However, it is only a matter of time until American cities begin experimenting with Protected Intersections. Why Aren’t Cycle Tracks More Common in the US? Cities are increasingly ignoring AASHTO’s guidelines for these reasons. However, as we examined previously, this institutional inertia still serves as a major impediment to cycle tracks in states like California in which Caltrans legally controls the design of bike lanes. However, this is rapidly changing with Caltrans’ endorsement of the NACTO guide, along with state DOTs in Washington and Massachusetts. Expect to see more cycle tracks soon. I’m glad AASHTO is thinking of protecting my “convenient” left turns on San Pablo Ave in Oakland by recommending against cycle tracks.